Spread over 6000 square kilometers, Kahuzi Biega national park is situated in Bukavu town near the western bank of lake kivu in the borders of Rwanda and Democratic Republic of Congo. The park generates its name from the two volcanoes of Kahuzi and Biega, which are covered by the forest. Its land area makes it one of the biggest national parks in Congo and the whole of Africa sheltering a variety of wildlife life and birds. In 1980 Kahuzi Biega national park was included in the list of the world heritage site by the united nation has educational, scientific and cultural organization (UNESCO) due to its rich diversity. Regarding vegetation, kahuzi Biega national park comprise of marshes, forests, swamps, riparian forests and bogs, which serve as food and shelter for wild animals. In the west of the national park is the dense guineo-congolian wet equatorial rain forest while the mountainous regions are covered by forest vegetation. The summit of the two volcanoes (Kahuzi & Biega) is covered by endemic plants, subalpine heather, grasslands and dry savannah grasslands among others. Just like the sister Virunga national park, Kahuzi Biega national park is managed by the Institute Congolais pour La Conservation de la Nature (ICCN) which in charge of conservation and tourism. 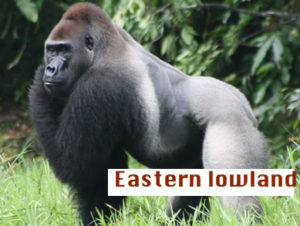 which are scientifically called Grauer’s gorilla, and is the largest gorilla specie compared to mountain gorillas, western lowland gorillas and the cross-river gorillas. Besides gorillas, the national park is a home to other primates such as the eastern chimpanzees (pan troglodytes scheinfurthii) and owl faced monkeys (cercopithecus hamlyni) and several other mammals such as bush elephant (loxodonta Africana), bush buffalo, eastern needle-clawed Galago, Maclaud’s horseshoe bat, alexander’s bush squirrel and the mount kahuzi climbing mouse. Also, the national park is a home to over 350 bird species some of which are endemic to the albertine region. If you are planning a safari to Congo, kahuzi Biega national park offers all you need on a safari. Being a home to the eastern lowland gorillas, gorilla trekking is the key activity done in the national park. An encounter with eastern lowland gorillas is an exceptional wildlife experience you should not miss out on your safari to Africa. The large size of these gorilla species make photography clear which provide travelers with memorable experiences. The trekking rules and regulations are similar to those of mountain gorillas and travelers must endeavor to follow the trekking these guidelines. To ease the trekking experience, two families’ of eastern lowland gorillas have been habituated for trekking. Other activities that can be done include volcano climbing, forest walks, and cultural tours. In addition, take part in bird watching expecting to spot a variety of different bird species, which include Congo peas fowl, Yellow crested helmet-shrike, Rockefellers, hornbills’ species, Ruwenzori Turacos, sunbirds and trogons among others. Despite the past civil wars that hot the whole of Democratic Republic of Congo with Kahuzi Biega and Virunga national parks serving as hide outs for the rebels, the country has stabilized and peace has been restored hence tourism done peacefully. Travelers are assured of their safety and that of their property especially the cameras. Also, tourism security has ben introduced to patrol all the national parks to detect any insecurity in the area. lodge, hotel begonias Bukavu, exodus Bukavu, Lakeside hotel Bukavu and Mount kahuzi hotel Bukavu among others. These lodges/hotels have experienced, kind and hospitable people ready to serve you with excellent services at any time of the day or night. Getting to kahuzi Biega national park can be reached via Kigali international airport crossing over Rubavu border. The park is roughly 30 kilometers from Bukavu town and can reached by road. Kahuzi Biega national park is roughly 232 kilometers, which is roughly 3 – 4 hours drive. 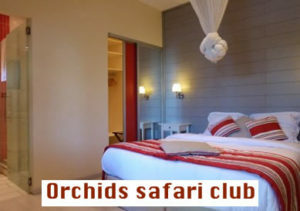 Conclusively therefore, book a gorilla safari to kahuzi Biega national park, trek eastern lowland gorillas and other wildlife rewarding you memorable experiences.